In addition to the war dead analysis of the 51st based on the records held with War Graves Commission (CWGC) the book includes an account from the Australian War Memorial (AWM) which outlines the involvement of Australia’s role in World War I; Pte. Duperouzel’s early life in York; enlistment in the AIF; the troopship journey from Fremantle to France, via Egypt, in April 1916; the descriptive Wartime diary of 611 Pte. Percy Nuttall, 50th Battalion; Pte. 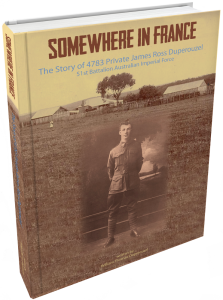 Duperouzel’s Service Record; In Memoriam tributes to ANZAC Heroes and a chapter about ‘Where the Australians Rest’. The appendices include a comprehensive list of the 321 ‘missing’ servicemen of the 51st Battalion (and their next of kin) who lost their lives on the Western Front during the Great War. These men, many of whom came from Western Australia, are commemorated by name and rank on the panels of the Villers-Bretonneux Memorial in France. Somewhere in France also pays tribute to the ‘York Boys’ who Pte. Duperouzel referred to in a letter written to his father, George, whilst on board the troopship, H.M.A.T. ULYSSES A38. Included also are some trench maps; a list of the Prisoners of War of the 51st Battalion; a selection of CWGC Military Cemeteries and Memorials on the Western Front, together with relevant extracts from ‘The Official History of Australia in the War of 1914-1918 Volume III’, written by Australia’s official war correspondent, Charles Bean. These describe the horrors of the bombardment and resulting carnage that took place during the advance on Mouquet Farm and Pozières in 1916. Added material from the book of Graham Keech, ‘Pozières – Somme’, enhances the reader’s insight into the events as they unfolded at Mouquet Farm.